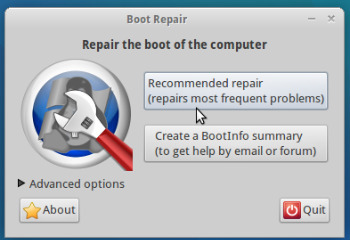 Boot-Repair-Disk is a very handy utility for those times when you need an easy-to-use tool to fix the bootloader of an unbootable operating system, no matter if it’s Linux or Windows. Repairs recent (UEFI) computers as well as old (MBR) ones. Write the ISO file to either USB-stick (using Rufus or similar program) or CD in order to boot them from the BIOS of a computer and repair broken operating systems.